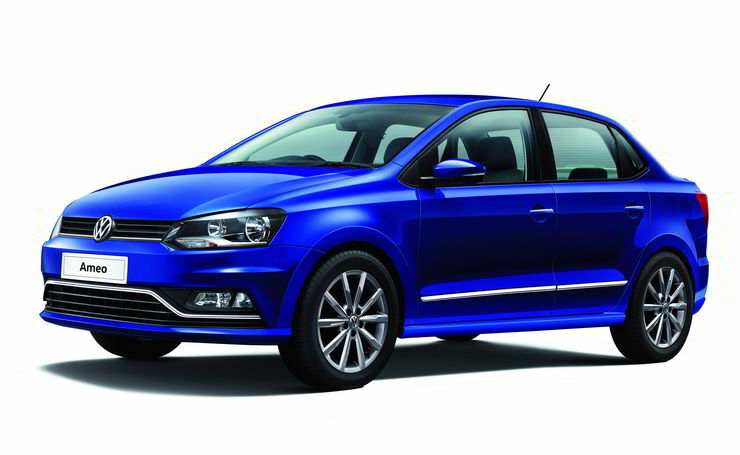 Volkswagen has today announced the launch of a special ‘Ameo Corporate edition’ in India. This variant of the Ameo has been specifically made to cater the corporate and business customers. The Ameo Corporate edition is priced starting at Rs. 6.69 Lakh for the MPI Highline Plus MT variant while the 1.5 TDI Highline Plus MT variant has been priced at Rs. 7.99 lakhs. With this, the German manufacturer is looking forward to sharing a bigger chunk in the sub-4 meter sedan game. It rivals the likes of the Maruti Suzuki Dzire and the Honda Amaze among others in the segment. If you don’t know already, the Ameo is an India exclusively vehicle that was designed to get benefit from the government’s tax relaxations of sub-4 meter cars. According to Volkswagen, the Ameo Corporate edition comes equipped with segment-leading features and safety elements. The Ameo is also the most affordable sedan in the country that comes with 100 Bhp plus power. The ‘Ameo Corporate edition’ will offer supplementary value-added benefits to the product and services as well. The Volkswagen Ameo is available in two engine options – 1.0L MPI and 1.5L TDI engine. The 1-litre MPI petrol engine churns out 75 Bhp of power along with 95 Nm of torque. The 1.5 litre TDI diesel engine, on the other hand, churns out 109 Bhp of power along with 250 Nm of torque. Further, the Ameo is available in 5 colours – Lapiz Blue, Reflex Silver, Candy White, Toffee Brown and Carbon Steel. All the variants of the Volkswagen Ameo come equipped with dual front airbags, galvanized steel body and ABS as standard. Talking about some of the features the car comes with, the Volkswagen Ameo is equipped with segment leading features like cruise control, rain sensing wipers along with segment-leading lights and the dynamic Touchscreen multimedia music system with AppConnect along with Auto air-conditioning system. Volkswagen is now offering a 4 year/ 1 lakh km standard warranty on all its cars. The company also offers free roadside assistance for 4 years from the date of purchase along with 3 Free services in 1 year or up to 15,000 km. This makes for a pretty good after sales package as you will get added RSA benefit along with free services and 4-year warranty without paying any extra amount. Note that this offer is applicable on all Volkswagen cars and not only the Ameo Corporate edition.